ArcGIS Online was updated this week, and this latest release adds many useful new features and enhancements! You can read more about the updates in the Esri blog post at https://www.esri.com/arcgis-blog/products/arcgis-online/announcements/whats-new-in-arcgis-online-march-2019/. Configurable Apps: Interactive Legend is a new app that allows you to explore feature layers in the map by interacting with the legend. App Builders: Web AppBuilder has a new Network Trace widget. Mapping & Visualization: Symbol sets have been updated in Map Viewer. You can now display georeferenced photos on a map by uploading a .zip file containing them. Spatial Analytics: Generate Tessellations is a new tool that creates bins over a study area, determined by a specified extent, shape, and size. Tessellations are useful because they allow you to split geography into regular shapes. Sharing & Collaboration: A new location filter helps you find items in your organization that are located in a specific place or region, or at specified latitude, longitude coordinates. Living Atlas: The OpenStreetMap vector basemap maintained and hosted by Esri, is no longer in beta. Small areas can be exported for offline use. Radiant Solutions NaturalVue 2.0, a virtually cloud-free global imagery mosaic, is coming soon as a tile layer in ArcGIS Online and Living Atlas. Learn ArcGIS: Recently published new resources, including a webinar on climate change mapping that shows you how you can use ArcGIS Pro to analyze climate data. Apps for the Field: Collector for ArcGIS can now be used alongside another app in Split View mode. External GNSS receivers are now supported in the Survey123 field app. Insights for ArcGIS: A redesigned and enhanced home page and support for distributed collaborations. Data Management: When you create a tile package in ArcGIS Pro 2.3 and later, you can specify a new file format—.tpkx. The .tpkx file format is an open specification tile package format that uses a simplified file structure, which allows developers to read and write files to the format. A new Arcade Attachments() function can be used during field calculations to calculate values based on attachments and their properties. Admin: ArcGIS Online now has more rigorous password requirements for new and updated accounts. If your organization has set up enterprise logins, you can now add members automatically using their enterprise ID. The sign-in experience in ArcGIS Online has been updated and streamlined, making it easier to sign in. Two Esri MOOCs are starting on February 6th. These Massive Open Online Courses are free, self-paced, and those who complete a course will receive a certificate. Do-It-Yourself Geo Apps: This four week course will show you how to combine location and narrative in one application to better communicate and broadcast your story, create custom web applications that solve problems in your community, and build powerful native applications for iOS and Android devices without touching a piece of code. Register for this course here: https://www.esri.com/training/catalog/57660ed7bb54adb30c9454a3/do-it-yourself-geo-apps/. If you have any questions, please contact us at highered@esri.ca. Agricultural Resources Inventory (ARI) 2017 – This is an update from the 1983 ARI, but differs from that data both in terms of coverage area and the way that the data has been classified. The 1983 dataset provides information on specific crops and field use, whereas this dataset broadly denotes land use. Both are available in the Portal. In addition to these new datasets, we have also made LIO’s topographic cache available as an basemap option in the GeoPortal. This detailed map was added based off of conversations had at our last in-person meeting in April (thanks to all those who suggested this!). It is available by clicking on Base Maps from the upper right corner of the GeoPortal and selecting LIO Topographic. Statistics Canada is the national statistical office. The agency ensures Canadians have the key information on Canada’s economy, society and environment that they require to function effectively as citizens and decision makers. New on Statistics Canada is the Cannabis Stats Hub website. This page allows users to look up Canadian statistics on the following topics: health, justics, economy and prices. The open data collection available through Land Information Ontario (LIO) is now fully discoverable in the GeoPortal! As a result of this launch, users can search for the newest LIO data, view metadata, and initiate a download of the data through the LIO download data request service directly in the GeoPortal. This has been made possible through an automated process of metadata harvesting, which pulls records directly from LIO’s site. This script will continue to run on a weekly basis, so that we always maintain the most current metadata and links. Since 1996, the Rumsey collection’s online database has been open to all, currently offering anyone with an internet connection access to 67,000 maps from all over the globe, spanning five centuries of cartography. Rumsey’s holdings constitute, a thorough collection of maps and though its physical housing at Stanford is a huge boon to academic researchers, its online archive is yours for the browsing, searching, and downloading, whoever and wherever you are. Click HERE to explore this wonderfully vast collection of online historic maps! The Geospatial Map and Data Centre is pleased to announce that ArcGIS Desktop 10.5.1 is now available to students. Click THIS link to request and download the newest version of the ArcGIS software. 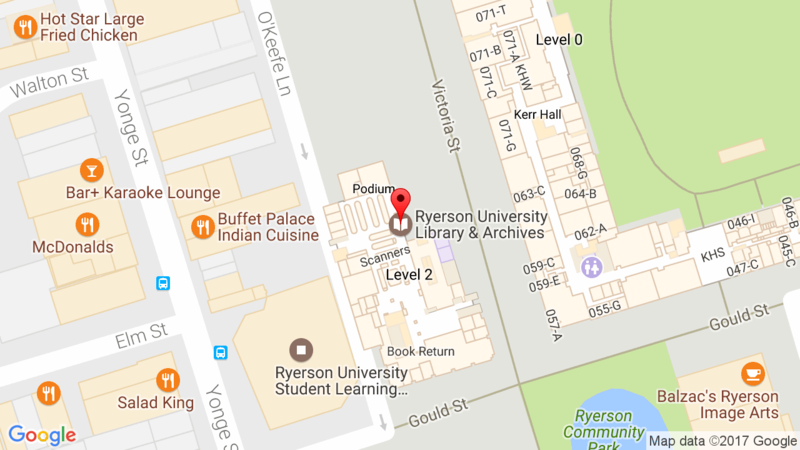 The Ryerson University Library & Archives (RULA) along with the Departments of Geography, Civil Engineering , Urban and Regional Planning and Chemistry and Biology share the cost and administer the ESRI Software – Campus Site License for access to the ArcGIS Suite of software. In addition to institutional access for ArcGIS Desktop software via the GIS & Data and/or departmental labs, students/staff/faculty in these participating departments or associated graduate programs may request ONE copy of ArcGIS Desktop – Student Edition software for academic use (teaching, research, educational purposes). Commercial use of the software is prohibited. Now available: the High Resolution Digital Elevation Model (HRDEM), at a resolution of 2 metres. The HRDEM consists of a Digital Terrain Model (DTM), a Digital Surface Model (DSM) and others derived data. This first release covers 106,000 km2 (3%) of the 3.5 million km2 planned for the Canadian southern territory, and includes areas in New Brunswick, Nova Scotia, Quebec, and Manitoba. This new product is generated from airborne LiDAR data acquired in partnership with provinces and territories to provide high accuracy data with minimum distortion. The HRDEM is part of the CanElevation collection created in support of the National Elevation Strategy implemented by Natural Resources Canada. This strategy aims to increase Canada’s coverage of high-resolution elevation data and increase product accessibility. For more details consult the product specifications. You can download this data on the Open Government website. With these additions, we now have Census Divisions (CD) data from 1851-1951 inclusive, and from 1981 through to 2011. The 2016 census boundary files have been recently released by StatsCan, and will be available in the Geoportal shortly. The entire collection of census and boundary data has also been reorganized to ensure naming continuity, and that all datasets are under series-level records whenever possible, including for the French language datasets. You can access this collection (126 data services) in the GeoPortal by browsing the ‘Subject Category’ field and selecting Census and administrative boundaries.